We’re excited to announce that we’ve added a new, detailed corporate compensation data set to CharityCAN courtesy of Thomson Reuters. 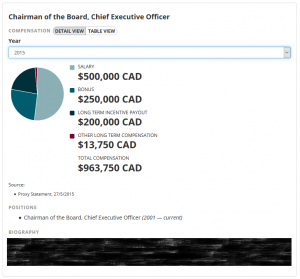 In addition to finding information on past corporate positions on individual donors, you can now use an integrated search to search and view detailed compensation breakdowns, positions and individual biographies for people all over North America. In the past, we were only able to show users a total compensation number for someone working at a public company. With this new data source we can now break down compensation by salary, bonus, short/long term compensation and in some cases, the sale of stock options. Each corporate affiliation also contains a biography on the individual and a historical list of past positions at that organization, where available. All the data is sourced from corporate filings required by regulators in Canada and the United States, but indexed and provided in an easy to read and digestible format. We’ve also included these new compensation breakdowns in our prospect profiles where our algorithm has been able to match them up, so now it’s even easier to get a picture of someone’s capacity for giving at a glance! This is just the first application of this new corporate data in CharityCAN, so stay tuned for further improvements! Please get in touch if you have any questions about this new data set, or if you’d like a free trial to give it a spin!